Outdoor features like custom built kitchens, stone BBQ pits, grills, and bars are becoming increasingly popular features for homeowners. Why? Because they are a beautiful, functional, and valuable addition to any property. If you enjoy entertaining outdoors and want to truly WOW! 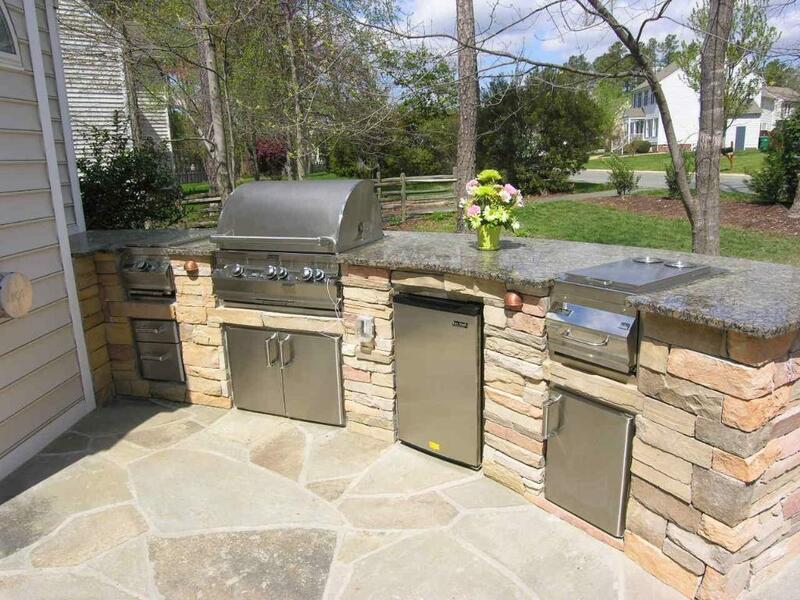 your guests, consider installing an outdoor kitchen or grill. Arbor Hills Landscaping is here to fill you in on how we can transform your outdoor space into a functional, cozy area designed to entertain and relax. When you invest in an outdoor kitchen or grill, you are enhancing the function and aesthetic appeal of your property which, in turn, increases its value. Is your indoor kitchen too small? Are you constantly wishing you had more counter space or an extra oven around the holidays? Outdoor kitchens can provide that solution. They can be designed and customized to fit your lifestyle in several ways. At Arbor Hills Landscaping, we have installed custom outdoor gourmet kitchens featuring refrigerators, ice makers, trash compactors, wine bars, ovens, grills, islands, and more. READY FOR THE LANDSCAPING PROFESSIONALS TO GIVE YOU A HAND? Whether you want a grill island or full blown outdoor kitchen, We can help turn your dreams into reality. We’ve got the knowledge your lawn needs to get it ready for summer. We can help you plan, plant, and create the yard of your dreams. We offer FREE ESTIMATES, best quality, and prices.